Much as I love travelling by train, experience has taught me that UK rail journeys can be fraught with difficulty. I’ve documented some of my concerns before, like ridiculous ticket options and mobile email woes. The train company operating services from London Paddington to Bristol, Bath and the west of England was, until recently, called First Great Western. First Great Western was such a hit that, at the height of its notoriety, it spawned several critical websites and was even subjected to a strike by its passengers. The First Great Western moniker was retired earlier this year and the company renamed itself Great Western Railway. Given the brand’s chequered history, this decision probably makes sense. The elegant new livery looks fresh and echoes the railway’s history. The company’s website grandly proclaims that it has ‘given the West back its Great Western Railway’. So far, so pretty. But the road to poor customer experiences is paved with good intentions. Today I wanted to book a simple journey: a day return from London to Bristol. Should be easy, right? Errors are always frustrating. They obstruct your progress and prevent you achieving your goals. But errors like this are particularly irritating because they don’t explain what’s happened, nor make any attempt to apologise. A simple ‘sorry’ — no matter how automated and insincere — is better than none at all. What’s more, when presented with vague errors, many people blame themselves — even when the problem really isn’t with them. 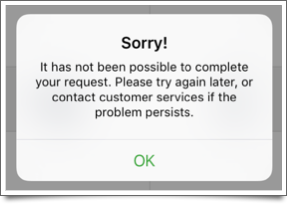 Irritated by this error and somewhat lacking in patience, I turned to the company’s iPhone app. This proclaims it can store mobile tickets, so I was briefly excited at the prospect of being able to travel without a paper ticket. On the plus side, this one at least says sorry. But, again, it doesn’t tell me the cause of the error. Nor does it provide any contact details for customer services. After seeing this 3 times, I’d had it. So I visited another train ticketing website and booked my tickets there instead. Fresh new start, same old story? For GWR this whole experience feels like a missed opportunity. It was my first real interaction with the company since the rebrand, and a good opportunity to impress me. Instead, I left wondering if anything has really changed underneath the pretty new livery. Come on, GWR. Give some thought to your customer experience, as well as to what colour you paint your trains. I am having a nightmare with GWR ,first I am issued the wrong ticket. I wanted to get an open return for my sons it issues a day return so I rang GWR and was assured this ticket would be cancelled and Ineeded to buy another ticket this time an open return. The day comes when the correct ticket should have been issued at the station . It did not . Numerous phone calls no answer for thirty minutes. I am owed £80 at the moment . You have to listen to a stupid recorded message and inane music to calm the poor customer down!